Hyaluronic Acid is a natural component of the skin and cartilage that is also available (such as other vitamins and minerals) in topical form - such as serums. 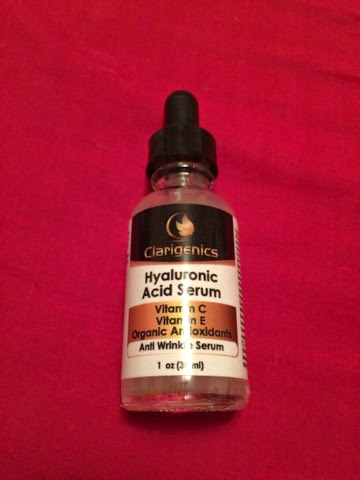 I was recently given the opportunity to try a Hyaluronic Acid Serum from Clarigenics. Because new items introduced to any skincare routine can take 30 to 90 days to show it's full effect, my plan with this review is to give you my first impressions on the product I've used and any effects I received within 30 days of using the products mentioned here. The Clairgenics Hyaluronic Acid Serum is the perfect moisturizer for all skin types - including my super oily and acne prone face. This serum not only contains hyaluronic acid to lock in moisture, but also vitamin c to reverse sun damage, jojoba oil as an antibacterial moisturizer, witch hazel to fight acne, vitamin e to repair damage, green tea to neutralize environmental damage, and aloe to heal and soothe the skin. I found this serum to feel both moisturizing, but renewing and protective as well. I'm happy with this serum and enjoy using it both in the morning before my makeup and in the evening. You can learn more about, or purchase, Clarigenics Hyaluronic Acid Serum on Amazon.